We were baby-sitting my mother-in-law's cat (Lucy) for a week or so. She found a box, crawled inside it, and was just the most pitiful - yet cute - cat ever. She stayed perfectly still and let me set up my camera about one foot away from her. This particular photo was taken on the high-speed sports setting with a ½ second exposure. She also held still for other pics with a 15 second exposure but I liked this picture the best of the bunch. Pet 360's article, 10 Ways to Unknowingly Crush Your Cat's Spirit. Pinterest also reprinted this article with Lucy's image. Pet crematorium in Jaén, Spain. Japanese article on using a cat to find wi-fi hot spots for hacking. 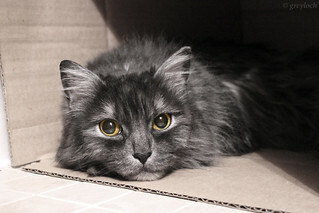 Japanese article on three theories why cats like boxes so much. A random Tweet. No, scratch that, I found her on multiple Twitter and Pinterest feeds. An article - I wish I was making this up - on the detrimental effects of scaring your cat with a cucumber. WTF? o.O?? A newer article (10/10/2017) from a Mexican blogger about Depression in Pets. I found 10 pages of hits off of Google's reverse image search engine. Maybe I should think about marketing Lucy's image?